Retinoblastoma Artificial Eye | Ocular Prosthetics, Inc.
Retinoblastoma is a cancer of the eye, usually diagnosed during childhood. It accounts for almost 3% of all cancers discovered in children before the age of 15. This type of cancer is curable if it is detected early and treated quickly. Although, even curable cancers unfortunately leave the patient with progressive symptoms. Studies have found that 97% of patients who survive retinoblastoma are left with some degree of visual impairment. A majority of these patients, almost 60%, are also faced with the loss of one their affected eyes. 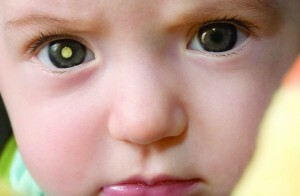 Due to the severity of these symptoms it is very important for parents to recognize the early signs of retinoblastoma. Family history of the disease is not a good indicator of a patient’s risk; 90% of patients have no immediate relatives with the disease. The most common, and easy to recognize symptom, is the abnormal appearance of the pupil. Children with retinoblastoma will often have a white glow on their normally black pupil, also known as a cat’s eye reflex. If you notice this symptom in your child, you should contact your ophthalmologist immediately for an eye exam. If a patient is diagnosed with retinoblastoma, and surgery is recommended, the surgical procedure is known as an enucleation. This procedure, to remove the affected eye, is the recommended treatment to minimize any further risk to the life of the patient. During this procedure, the oculoplastic surgeon removes the affected eye, and restores the eye socket volume with an orbital implant. The orbital implant will enhance the movement of the eyelids and motility of an ocular prosthesis. In cases where an enucleation was performed, the patient and their family will be referred to an ocularist. An ocularist is a specialist in the fitting and fabrication of prosthetic eyes. It is important to know that Ocular Prosthetics, Inc.’s team of ocularists have extensive experience with patients recovering from retinoblastoma. Stephen Haddad, Los Angeles Board Certified Ocularist, has over 20 years of prosthetic eye care for survivors of retinoblastoma. At Ocular Prosthetics, Inc., our specialized treatment techniques were developed under the guidance of the late Nancy Mansfield, Ph.D., former president of the Institute for Families at Childrens Hospital Los Angeles. Stephen and his team’s dedication to the sensitive care of these patients is second to none. Please contact us today at any of our five office locations for more information on our services for retinoblastoma survivors. For those patients and families looking for community support, Retinoblastoma International (RBI) is a great start. RBI is a 501 c3 nonprofit organization founded in Los Angeles, CA, which focuses on infant retinal cancer and its complications. This organization funds research and awareness programs to continue its mission of eradicating retinoblastoma. We encourage you to contact Retinoblastoma International, www.retinoblastoma.net, for more information.